This page offers a detailed description of Carrara dedicated features in P3dO. scene References thumbnails aka Scene Manager. We love Carrara. More features are coming. We are also eager to hear from you and add more	features for Carrara, any suggestion welcome. P3dO is showing all CAR and CBR thumbnails. HDR/HDRI viewing is	a long time P3dO feature. Of course you have thumbnails for textures as well. Look here for a list of P3dO pro formats. Also note that P3dO allow to stretch thumbnails up and you can then have 128x128 or	176x128 thumbs (selectable from 48 to 256) instead of Carrara default ones. 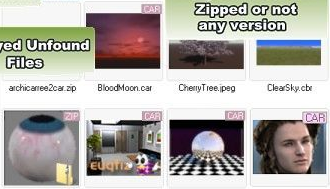 P3dO allow to edit Carrara thumbnails (CAR and CBR) and thus add your personal touch. add a picture to a file with missing thumbnail. change the thumbnail size (64 to 86, 86 to 64). compress or uncompress the output. P3dO's editor is a raw tool and has no other feature than Copy - Paste - Save. You will customize the picture in your regular picture editor and P3dO will do the rest. P3dO will list a CAR and CBR references (Textures, Movie,..) in a directory Tree structure or in a thumbnailed view. This allow to manage a complete Scene without the need to navigate to the various directories where those References are stored. Managing means all the operations you would do with Windows Explorer: Copy, Cut, Paste, Edit, ZIP,... anything in your context menu. We call this Scene Manager and this is an incredible time saver. All 3D file formats in P3dO share this capability. Poser has an extended Scene Manager which is called Runtime Manager. You have to tell P3dO where your Carrara Runtimes list (Preferences.txt) is. See Configure	P3dO for Carrara below for details about this step. Once done this button will be displayed on the Folders toolbar. This is a drop down list of your Runtimes and gives you the the ability to quickly navigate	to your Runtimes. You have to tell P3dO where Carrara is and where your Carrara Runtimes list (Preferences.txt)	is. Go to Options dialog, Carrara tab and set "Carrara Location" and	"Preferences Location". Preferences Location is rather tricky but P3dO does nearly all the job. All you have	to do is to pick the proper Carrara directory located under its pre-selected Daz parent	(See snapshot). It is not possible to open a Carrara file from	P3dO into Carrara. When you do so, Carrara will create a new Scene. We are looking for	a way to bypass this, any idea welcome. P3dO is highly reliable in showing Carrara thumbnails	but you may still see icons while Carrara will show you a picture. This is because not all	Carrara file have a thumb and in that case Carrara is showing a default picture. P3dO	is not doing this in order to highlight missing thumbnails cases. CBR pictures may be saved at 86x64 dimension	but only at 64x64. This is a Carrara browser limit and P3dO will take care of this	for you. All Carrara versions are suported so far. However note that Carrara Runtimes were only introduced with Carrara 7.